THP 1-13-080 HUM (#592 THP) Green Diamond Resource Company, 120 acres; 76% clearcut, 22% no-harvest, 1% roadside, misc selection logging. Upper Tectah Creek, Mettah Creek, Lower Tectah Creek, Johnson Creek (HUM: T10N R2E Sec.3; T11N R2E Sec.26, 27, 34). Wet weather operations, high erosion hazard, steep slopes up to 75%, steep roads, unstable area in unit A, impaired 303.d watershed, herbicides, coho watershed, 4 spotted owls within 1.3mi, scattered large trees. Estimated public comment deadline: 10/24/13. 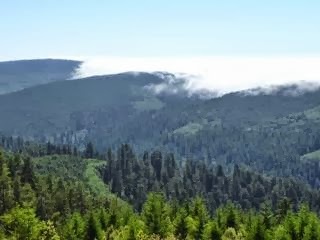 This THP is about 6 miles east of the town of Orick, and within a few miles of the eastern border of Redwood National Park. Green Diamond Resource Company is planning a mostly clearcut tractor and cable logging operation in second growth Douglas fir and redwood forest at an elevation of 960 to 2,400 feet. The THP area flows eastward into the Klamath River which Is listed as impaired for sediment and temperature. 270 feet of steep road is planned near a watercourse with slopes over 65%, and there is a small unstable area in unit A outside of the logging area. More information is available on the THP Tracking Center website.